The history surrounding #Disneyland is rich in American Culture. Whether this is your 1st visit or 50th visit, these tips will surely amaze your friends and family. 1. There’s a basketball court in the Matterhorn. You’d never know by looking at it, but hidden in the middle of the iconic Matterhorn Bobsleds is a basketball court, albeit a small one. Really, it’s just a hoop on a backboard with some floor markings. 2. Disneyland is home to hundreds of feral cats. The adorable kitties are there to help — as a cast member once told us, “To keep the Minnie and Mickey population down.” The cats are well cared for with a vet on staff, various feeding stations, and lots of love from Disneyland workers. If a cast member falls for a particular feline, they have the opportunity to adopt the cat and bring it home. 3. You could buy a bra on Main Street. Nestled among the gift shops of Main Street (for a measly six months) was the Intimate Apparel Shop, presented by the Hollywood-Maxwell Brassiere Co. of Los Angeles. The Victorian-style shop, which closed in 1956, featured the Wonderful Wizard of Bras, a narrated slideshow that gave a history of undergarments. 4. Every horse on the King Arthur Carousel has a unique name. The most famous horse is Jingles, which was reportedly Walt Disney’s favorite and is now decorated with a tribute to Disney’s Mary Poppins. But Jingles’ pals should not be ignored; the other horses include Fern, Frenchy, Gypsy, and Hoot, among 63 others. 5. You have Disneyland to thank for Doritos. During the early ’60s, the Mexican eatery Casa de Fritos (now Rancho Del Zocalo) would take stale tortilla chips, spice them, and fry them up, creating what we now know as Doritos. Inspired by the traditional Mexican snack totopo, the chips became extremely popular — so popular that Frito-Lay bought the concept and debuted Doritos to the world in 1966 as the first marketed tortilla chip. 6. The drawbridge in front of Sleeping Beauty’s castle is operational. The picturesque bridge isn’t there merely for show; it can actually be raised and lowered. It’s only been utilized on two occasions — at the opening of the park and the reopening of Fantasyland. 7. The land used to be home to orange groves. The 160-acre area in Anaheim that become the Happiest Place on Earth was once rural farmland with many crops of citrus trees. If you stay at the Grand Californian Hotel, the remodeled rooms pay tribute to the orange grove past in various ways, from the headboards to the art on the walls. 8. There’s a 122-year-old palm tree in the middle of Disneyland. Many trees grow in Disneyland, but one is uniquely special and really, really old. A Canary Island date palm tree was planted way back in 1896 and was spared the ax when Walt Disney decided to keep the already majestic palm (but he did end up moving it a bit). It still stands in Adventureland and can be found right near the FastPass distribution kiosk near the Jungle Cruise ride. 9. Four babies have been born in Disneyland. Sometimes an infant just can’t wait to enter the world, be it in a taxi, in the lobby of your apartment, or in the middle of Disneyland. The four babies catching their first breath of fresh Disney air were born on a bench near the entrance, at a Disneyland First Aid station, in a back room office and, most recently, in a Disneyland parking lot. 10. The plants in Tomorrowland are all edible. No matter how hungry you are, you shouldn’t nibble on the plants in Tomorrowland, even though most of them are edible. Lemons, oranges, lettuces, peppers, and a variety of herbs can be found in the landscaping. 11. There is one ride that is way older than all the rest. Disneyland’s King Arthur Carousel in Fantasyland is even older than the park itself, by several decades. The Dentzel Menagerie merry-go-round was estimated to have been built as early as 1875 and was in use from 1922 at the Sunnyside Beach Park in Toronto until Walt Disney bought it for his park. 13. Does Disneyland’s Castle seem a whole lot smaller than Walt #Disney World’s? It is. Disneyland’s Sleeping Beauty Castle stands at 77 feet tall, while Walt Disney World’s Cinderella Castle is 189 feet, over twice the height. 14. Walt and Roy Disney tagged the balcony in New Orleans Square. Above Pirates of the Caribbean, there are two very decorative sets of initials made of iron integrated onto the balcony. The initials are for Walt and his brother Roy, making their mark on their creation. 15. Those aren’t official American flags on Main Street. The red, white, and blue flags atop the buildings in Disneyland may look like real American flags, but they’re not! The flags only have 45 stars rather than 50 so that they don’t have to fly by official flag rules such as having them illuminated at night or taken down at the end of the day. The one official American flag stands at the front of Main Street, where there is a touching Flag Retreat Ceremony every day at 5pm. 16. The doors work in Storybook Land. The charming houses on this Fantasyland ride feature doors that actually open and close. This was done so that cast members would have the ability to change the tiny lights inside the homes. 17. Eeyore lives with Indiana Jones. Where Indiana Jones Adventure, Temple of the Forbidden Eye stands was once the Eeyore parking lot. To pay homage to its last incarnation, the Imagineers hid one of the old parking signs in the queue for the ride; it’s right by the film projector in the projection room. 18. The cast of the Country Bears hangs out with Winnie the Pooh. Max, Buff, and Melvin — the three talking trophy heads from the long-gone Country Bear Jamboree — can still be found in the area they once called home (the Winnie the Pooh ride replaced the Country Bears back in 2003). As you’re leaving the Heffalump and Woozles scene, look up and to the back and you’ll see them. 19. The harpsichord in the Haunted Mansion is a movie star. Found in the Haunted Mansion Grand Hall, the large harpsichord featured is a prop from the classic Disney movie 20,000 Leagues Under the Sea. 20. Indiana Jones’ office is full of real Indiana Jones stuff. In the queue for Indiana Jones Adventure, Temple of the Forbidden Eye, there is a scene depicting Indy’s office. Many of the items on display are actual props from the movies. 22. It’s a Small World really is precious. Instead of using a gold-colored paint, Disney used actual 22-karat gold. The reason, it’s said, is that paint would oxidize and fade while real gold would stay shiny and bright, and in the long run cost less money since there would be less maintenance and upkeep. 23. Popcorn people exist. Every popcorn cart in Disneyland has its own mascot, a little creature — from a Yeti to Davy Crockett — that appears to churn the popcorn popper. 24. Pirates of the Caribbean was going to be entirely different. Instead of the boat ride that we all know and love, the attraction was originally planned to be a wax museum displaying the history of pirates, including famous seafaring figures such as Mary Read and Anne Bonny. 25. Splash Mountain initially had a different name. On a hot day, there is nothing better than a ride on Splash Mountain, but instead of that name we’re all totes used to, it was going to be called Zip-a-Dee River Run. 26. The Haunted Mansion’s hitchhiking ghosts have names. They’re Ezra, Phineas, and Gus, FYI. 27. There used to be a smoke shop on Main Street. Yup, right there in the middle of Main Street there was The Tobacco Shop that carried tobacco and smoking accessories from around the world, from hand-carved pipes to pouches of exotic tobacco. Surprisingly, the shop was open from 1955 until 1991! 28. A few stars got their start at Disneyland. Steve Martin worked at the Magic Shop, Michelle Pfeiffer dressed up as Alice in Wonderland and greeted guests, and Kevin Costner was a Jungle Cruise skipper. 29. There’s a unique symbol on the Partners statue. Look closely at Walt Disney’s tie, and you’ll notice a tiny symbol that almost looks like a Japanese character. It’s the brand for Smoke Tree Ranch, an area in Palm Springs, California, where the Disney family had a vacation home. 30. There’s an actual apartment near City Hall. Right above the fire station, Walt Disney had his own private, albeit small, apartment for his family. A lit lantern is kept in the window in honor of Disney. 31. Real skeletons were used on Pirates of the Caribbean. In the early days of the ride, several real sets of human remains — courtesy of UCLA’s medical center — were used as props. Rumor has it that one is still there, the skull that accents the bed in one of the vignettes. 32. The voices of Disneyland are married. The official announcer for Disneyland, Bill Rodgers, is married to Camille Dixon, the announcer for California Park Adventure. 33. George Lucas gets a tongue-twisting shout-out on Star Tours. While waiting in line for Star Tours, listen closely for the announcement that addresses a passenger named “Mr. Egroeg Sacul,” which is George Lucas — the creator of Star Wars — spelled backward. 34. There’s a time capsule buried in Disneyland. 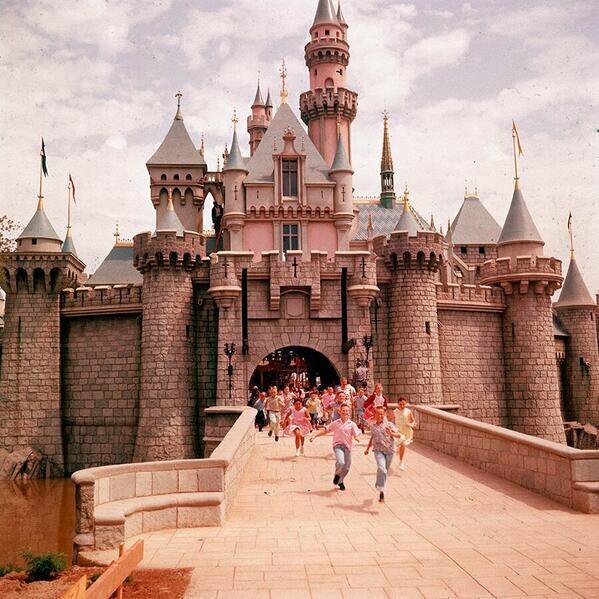 Right in front of Sleeping Beauty’s Castle, on July 17, 1995 (the park’s 40th anniversary), a time capsule was buried. It’s to be opened on July 17, 2045. 35. Cast members use code words. Disneyland employees use a variety of shorthand terms to communicate, such as “code V” for vomit, “code U” for urine, and “code H” for horse poop.